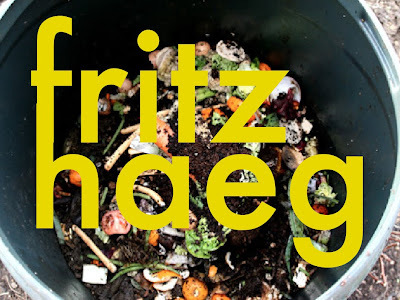 The compost pile is a metaphor for everything right with the world: at least in the world of Fritz Haeg. This decaying organic matter is the engine of the garden and as such deserves an honored place. In elevating the compost pile to an object of beauty, I believe Haeg, would agree with Cole Porter, "I'm a worthless check, a total wreck, a flop, But if, baby, I'm the bottom you're the top!..." Haeg wasn't the first person to jump on the grow your own food, think global, act local bandwagon. Alice Waters has been at it for years. It's true that Fritz has put a new twist on the movement by convincing people to grow food on their front lawns in suburban neighborhoods. The Edible Estates, project and book, were the subject of Haeg's lecture at the New York Botanical Garden. Haeg is like the Descartes of the garden world. He is full of questions and philosophical dilemmas. After showing an aerial view of Levittown, Haeg ask the audience "I am interested in what we do with what we have inherited. What are we gonig to do with these spaces now? " What are we going to do? Haeg gives us a brief history of the lawn. "It's all about isolation." The lawn symbolizes the American dream: comfort, prosperity: it demonstrates to the community that you are doing well. When reconsidering the lawn, Haeg suggests we are reconsidering our value system. Ultimately, Haeg is about engaging in dialog with each other. Make a garden on your front lawn with a space to hang out in. Everyone has their own little town green. Ask yourself and your neighbors, how you want to live NOW! Question your idea of beauty. The Edible Estate gardens are not magazine gardens. The idea is that anyone can make a garden. Oddly enough, the current economic downturn may be just the thing. Maybe we are all going to slow down, plant some seeds and enjoy the fruit of our labors. Or maybe, we are just going to start a conversation. And that's ok with Fritz Haeg. A tall man carrying two small "suitcases" walks into the Horticultural Society. Each case contains a slide projector and carousel. A young with dreadlocks is asked to assist the tall, lanky stranger. The young man looks at the equipment and is totally perplexed. He asks the man, "Can you help me, help you?" To a certain generation, a slide projector is a foreign object. 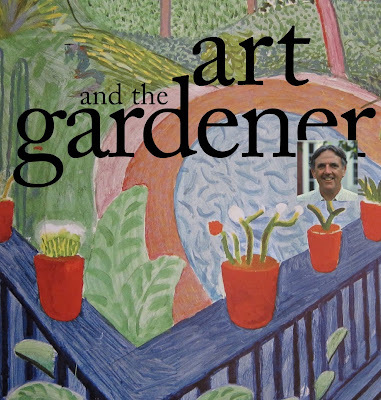 So began the preparation for Gordon Hayward's slide lecture, Art and The Gardener, the title of his new book. Author of ten books and endless articles in defunct and current gardening magazines, Gordon has developed a theory about the relationship between art and garden design. As he begins to speak, I become immediately skeptical. I have an pathological distrust of people, who try to fit things, especially artistic endeavors, into neat little categories. So I waited for Hayward's theory to unfold. The first slide was a landscape by Thomas Cole paired with a stone ruin created by the environmental artist, Dan Snow in conjunction with a garden Gordon designed. A romantic, pastoral, landscape painting of Italian ruins by Cole is compared to a garden design by Hayward. The same peace and respose found in the painting is juxtaposed with the feeling of timelessness created by the plant palette, pruning of crabapples and the stone ruin in this garden. I could see the relationshp. I just wasn't sure whether this construction was just a case of the chicken and the egg. 55 minutes later, having looked at Monet, Renior, Van Gogh, Degas, Derain, Heade, etc. 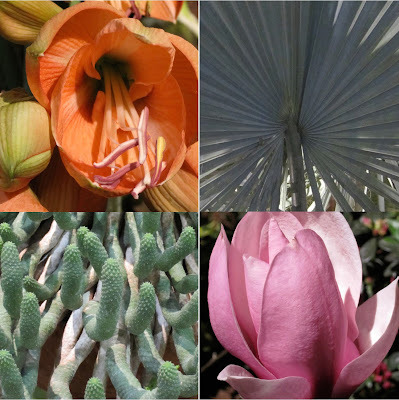 and countless photographs of gardens with similiar compositions, color palettes, textures, organization: I still wasn't convinced that Hayward's theory of "conscious seeing" was a tool to used in garden design. Or even a valid way of analyzing garden designs. I have spent a good part of my life in museums and galleries. And I am sure that consciously or unconsciously every painting, print, or sculpture has in some way influenced my garden designs, but not in the pedantic way Hayward suggested. For me his theory is a gimmick. In the beginning of the lecture, Hayward told us that the average time a person spends in front of a painting is 6 seconds. I agree with Gordon on one point: 6 seconds is not enough time. What do these two women with in common? They are both story tellers. Dominique Browning's story is her own life in transformation: from high-powered editing to slow living. 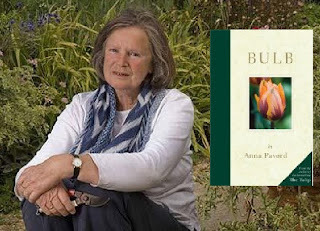 For Ann Pavord, plants, specifically bulbs, are the subject matter of her stories. Pavord is interested in the whole package, from discovery to voyage to planting. Browning spoke on Tuesday night as part of the Wave Hill Horticultural Lecture Series. Her saga has become an all too common one: lost her job, went into a tailspin and came out the other end with a different life. 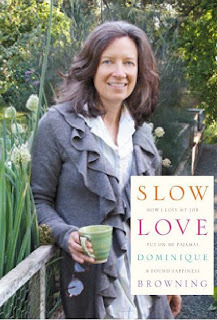 Her new book, Slow Love recounts her journey: which includes leaving a garden of 25 years and making a new one. "I started wearing glasses as a child, when I was diagnosed as near-sighted. I believe, I developed a habit of looking closely at things." 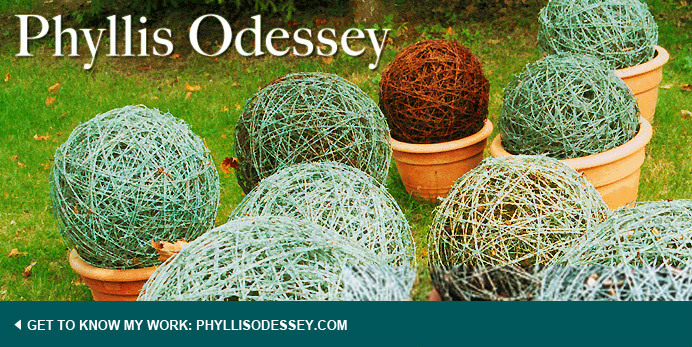 As her life unraveled, this habit of observing became a strategy for living...and gardening. Browning talked about the idea of a long minute. "Nothing to do is the place where hope begins to be possible." Not worrying about failure is the guiding principle of her new way of gardenomg. No grand design. No overall scheme. Simply put: starting with a plant and seeing where it takes you. If there is anyone on the planet, who has started with a plant and seen where it takes her, it is Anna Pavord. Pavord became famous for her book, Tulip. Followed in 2009 by Bulb. Both are exhaustive tomes. Pavord is interested in the back-story of plants. 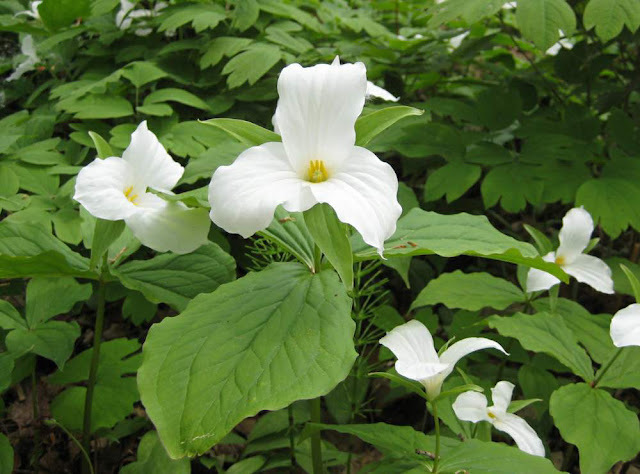 Where plants come from, how they got their names, their personalities, native habitat and who were the people who brought these plants to the "new world." I don't know if there is something in the water in Great Britain or the genes, but British gardeners have a way of talking about plants that draws you in. It's beyond enthusiasm. It's as if deep observation of nature is part of their DNA. Does living in a small country make you concentrate on what's beneath your feet more? Whether Anna Pavord is talking about an exotic South African lilly or an ordinary iris, her tone is the same. "Bulbs are the best kind of dinner guests. They are the first to greet you and the first to leave. Who could ask for more?" It's that wonderful way of characterizing an aspect of bulbs that many people don't treasure, that gives Pavord her unique voice. In some ways, I can't think of any two women so different in their approach. 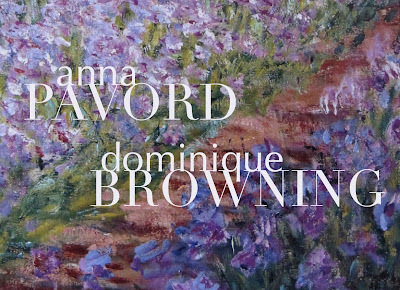 Browning's obsession with self; documenting the slightest quiver in her mind. Pavord's self her power of regarding attentively backed up by phenomenal research. 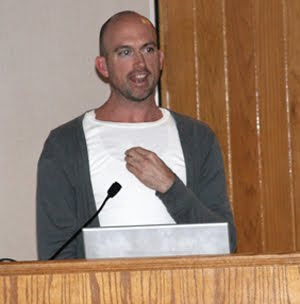 Browning spoke on Wednesday evening; Pavord on Thursday afternoon. At the end of Pavord's talk she asked if anyone in the audience had any questions. A hand was raised. Dominique Browning stood and asked Pavord, "I understand you moved to a new house, did you take any plants with you?' Pavord, "Just two." The great explosion in flowering plants during the Cretaceous Period is one of the great enigmas of evolution. Charles Darwin had no explanation, calling it an "abominable mystery." But now scientist think they have solved the riddle of how flowers came to dominate the conifers and ferns that preceded them. The flowers' secret, they say, was to exploit a change in soil fertility, and create a feedback loop that allowed new flowers to feed off dead ones. I am not a fan of orchids. They are too exotic, too unreal, although, of course, they are very real. Perhaps, if I had lived in a place where orchids did grow naturally, I wouldn't have such a hard time with them. These orchids are from The Orchid Show at the New York Botanical Garden. Enjoy! Yes, this is really the color. No food dye. The colors, the shapes, what's a girl to do. The next thing I am going to do is ask an "orchidolic" why they are fascinated. Stay tuned. Copyright Helen Miranda Wilson. No usage without permission. What a relief to walk into a gallery and focus on a single painting. Helen Miranda Wilson's paintings have always been small, intimate and require your attention. The current show at Lori Bookstein Fine Art doesn't disappoint. 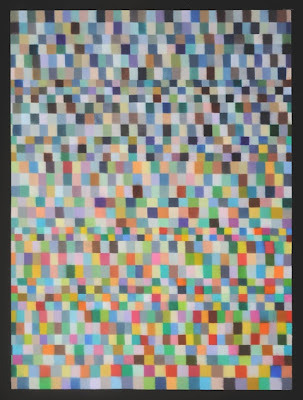 Mondrain, Bridget Riley and Paul Klee, all come to mind, but what distinguishes Wilson's paintings is her touch. I love the feeling for paint. Those little squares are not hard-edged. They kind of run into each other. The tension between one color and the next color sing. After leaving art school, Helen and I shared a studio. Helen has been painting ever since and I have gone on to do other things. Those of us who have been following Helen's career, never expected her to move from figurative to abstract paintings. But that's the thing. Helen always surprises you. I am watching the snow melt and the hammamelis bloom. 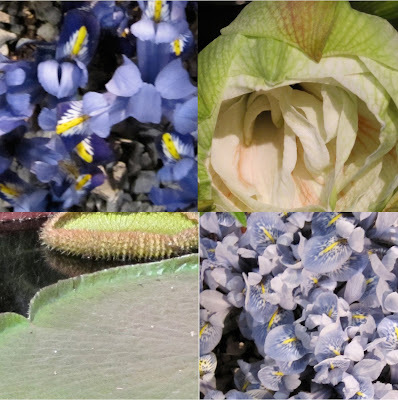 On Wednesday, February 24th, Scott Canning, Director of Horticulture at Wave Hill (http://www.wavehill.org) brought a vase of Hammamelis to the lecture (see post: Is Horticulture Over?). Scott had a couple of different varieties, but the one that I thought was outstanding is 'Birgit". "The darkest-red flowered witch hazel cultivar introduced to date. 'Brigit' has rich purple red flowers produced on a vigorous plant. Autumn color is butter yellow suffused orange red. 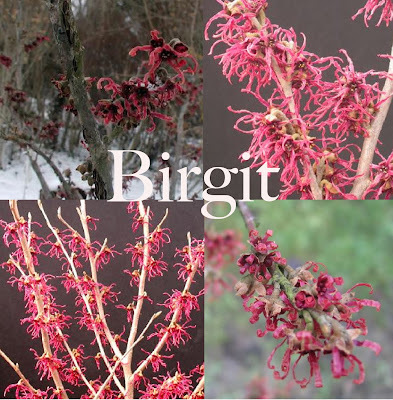 Although not highly scented, 'Birgit' will add a unique touch to your winter landscape. Plant one today!" Only in the UK: Winter open day. "Don't miss the opportunity this month to visit the garden of award-winning landscape designer Arabella Lennox Boyd at Gresgarth hall in Lancashire. This elegant garden is opening for....a Hamamelis Day...February 13. Copyright Peter Mauss. Photographs by Peter Mauss. 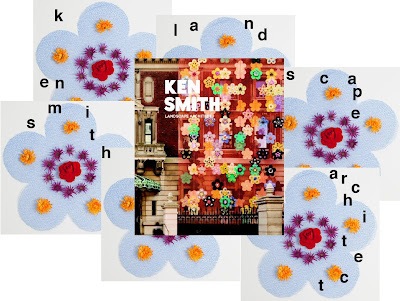 this can only be the work of Ken Smith. Ken is known as the "bad boy" of landscape architecture. He challenges our idea of what landscape can be. And that is why I never miss an opportunity to hear him speak. He throws convention out the window and rethinks ideas we take for granted. He likes boundaries; so he can figure out a way to break out of them. As he said Feb. 23rd , "I am a practitioner of critique." For example, the viewing garden at MoMA is exactly that. This is a garden that can be seen, but not visited. It was designed as an artistic construction to hide air conditioning ducts, etc. The garden consists of plastic rocks, recycled tires, glass pebbles, plastic boxwoods; all of which make a camouflage pattern when viewed from above. As Ken said, " the MoMA project is "artificially artifical..."
Asked what his next book might be, Ken responded, "The Book of Losers." A compendium of unbuilt projects. Ken's work is kind of addiction: once you get into it, you just want more and more. *Many of the photographs in the book were taken by Peter Mauss, my husband and I freely admit to being prejudiced in his direction. 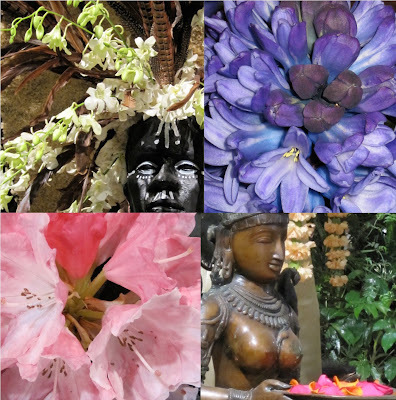 Every year I swear off gong to the Philadelphia Flower Show and every year I find myself buying a ticket. It's partly optimism and partly fear of missing something. Most of the time, I am disappointed. But I have to admit this year was different. One, I finally got the idea, it's all about the flowers. 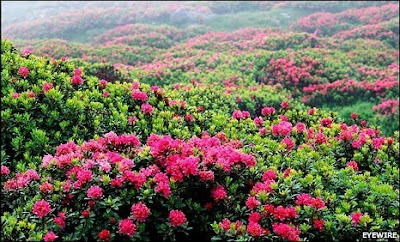 It has nothing to do with landscape design or garden design, it's purely a display of flowers. 2010 theme (and there always is a theme) Passport To The World. Each exhibit is dedicated to a part of the world...Africa, Brazil, India, New Zealand, etc. From the pungent smell of jasmine to the knock-me-over hyacinth, on a chilly day you can't beat it!